In my fifth car accident the tmj disk had been dislocated again and all the benefits of the surgery from the third car accident were undone. At first I decided I wouldn't have it fixed again. I couldn't face the thought of the surgery again and months without being able to chew, sing or even yawn comfortably. However I didn't want to have to put up with the spasms I was experiencing up the side of my head, so I asked God if I should go ahead with the surgery. God said to go ahead. When I visited my dentist he told me my surgeon was one of Australia’s best. He said he had watched him operate and it was "like poetry." I felt reassured. Poetry for the jaw of a poet! As I was coming in and out of consciousness from the morphine, that I needed an antihistamine for, I heard angelic singing in my heart, "tenderly, tenderly Jesus is calling, calling to you and to me ... Oh sinner come home" and "God will take care of you." When I was awake enough the songs reminded me to talk to God and so I began praying in between the moments of waking and sleeping. My blood pressure was either too high or too low and my oxygen levels also were too low during my hospital stay but the surgeon told me the operation had been successful. There had been a lot of scar tissue and the displaced disc had been resting on the muscle, which may have been causing the spasms. He had stitched it back into its proper place. At home I thought about the disc resting on the muscle. The muscle spasms hadn't been enough to push the disc back into place. The cushioning disc was being cushioned! I thought about the body of Christ and knew that the problem I had had with my jaw was similar to what the body of Christ experienced. Some people were resting on the muscle of others faith and ministry instead of being the cushion they were designed to be. They were not valuing their ministry of making things easier (cushier!) for those around them. Remaining in heir comfort zone was not helping others, it was a burden. I had been thinking that I would like to take a photo of a Kookaburra. At the church camp in 2008, I saw one but it was in the distance and didn’t stay long enough for me to get a closer view. In August while I was recovering from the surgery, Peter took my mother and me to Lilly Pilly to visit Peter’s brother and sister in law. 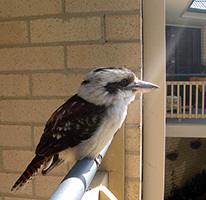 While we were there a Kookaburra came and sat on the balcony, allowing me to photograph him. He stayed for quite a long time until I had all the photos I wanted! That night as I read from my bible about God directing Kings and nations, I knew again that God was all powerful. The real king of the bush had created all things. He didn't just direct Kings, He even directed birds. I didn't need to worry. 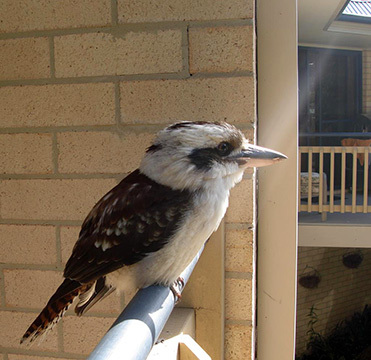 When I looked at the photos the following day, I noticed a sun ray spotlighting down, touching the kookaburra’s beak and it seemed to me that God was reminding me that He had been there. The light of heaven had been streaming down, spotlighting the bird I wanted to photograph. I wondered if God was about to open the door for me to speak too. When I was well enough I shared the message I had found about comfortable living not necessarilly being a blessing. It was sometimes a burden.